The fall of France in 1940 was sudden and shocking. French leaders believed that they had prepared for a potential war with Germany and were well prepared. Tragically, they were not. Within months of the German invasion, France collapsed. Why did France surrender so quickly? In September 1939, the German war machine invaded Poland, and World War II began. France and its Britain declared against Germany in 1939. The French army was in theory as strong as Germanys. It had a vast Empire and a sophisticated arms industry. It had also established a series of fortifications along the eastern border of the country along with Germany, known as the Maginot Line. The Line was designed to keep German forces out of France. Initially, France and Great Britain appeared to be a match for Germany. However, in weeks in the late spring and early summer of 1940, it became clear that France was woefully unprepared for the German onslaught. France suffered a humiliating defeat and was quickly occupied by Germany. Its failure was a result of a hopelessly divided French political elite, a lack of quality military leadership, rudimentary French military tactics. On the battlefield, France faced a vastly more prepared German army that utilized both more advanced weapons and sophisticated tactics. It was a mismatch. France had been fearful of Germany ever since the Franco-Prussian War of 1870-71. In this war, the Prussians had quickly defeated the French and occupied much of the country. In World War I, The Germans had come very close to defeating the French, and without allied assistance, the country would have lost to Germany. Despite being among the victors in World War One, the French still dreaded a conflict with Germany. During the Versailles treaty negotiations after the collapse of Germany during World War, French negotiators were adamant Germany's military had to be neutralized. The French initially led by Prime Minister Clemenceau, adopted a hard line towards the Germans in 1918-1919. There was a thaw in the Franco-German relationship in the mid-1920s, and there was hope of a genuine rapprochement between the two largest powers in continental Europe. However, the Great Depression and the rise of Hitler meant that the French were suddenly faced with a potentially aggressive regime in Germany. The French adopted a diplomatic policy of appeasement and sought to placate Hitler by offering him concessions, such as allowing him to re-militarize the Rhineland. Still, France took no chances and began to prepare their defenses. 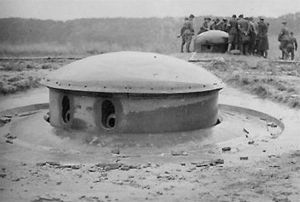 The French devoted a considerable amount of resources and capital to the construction of the Maginot Line. This defensive line was named after a French Defence Minister. The French constructed a long line of fortifications along their eastern border with German. It stopped at the Belgian border. The French stationed all their forces behind the Maginot Line and adopted a defensive posture. In September 1939, the French with the British declared war on Germany after Hitler invaded Poland. For several months, there was little or no activity on the Western Front. This period was known as the ‘Phoney War’. However, in the Spring of 1940, the Germans shifted their attention west and went on the offensive. The Battle of France lasted only 46 days, from the German invasion on the 10th of May to the surrender of France on the 25th of June 1940. Paris fell to the Germans on the 14th of June, after the virtual collapse of the French Army. French Prime Minister Paul Reynaud resigned on the 16 June during the catastrophe. His successor, Marshal Philippe Pétain, began negotiations to end the war. Between the world wars, the German army developed the Blitzkrieg tactics. This strategy was based on high-speed and mobile attacks on the enemy’s weak points, and it proved devastating in France. 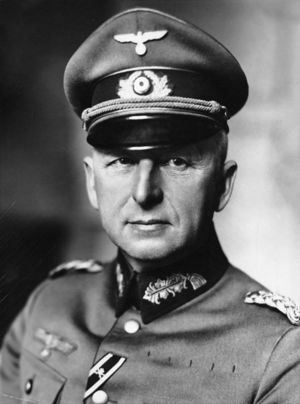 The German victory was founded on a plan developed by the great military strategies, General Erich von Manstein. He adopted the Schlieffen Plan that was almost successful in WW I. However, rather than advance on a broad front through Belgium, the Germans focused two-thirds of their forces, including most of their tanks, in the Ardennes region of Belgium. France and Belgium did reinforce the fortifications in this region because they assumed that the terrain was unsuitable for tanks. When the Germans attack came through the Ardennes, they caught the French and their British allies by surprise because the French believed it was impassable to tanks. Having successfully made their way into France, German forces then employed a tactic known as the ‘sickle stroke’. Sweeping across the northern plains of France at great speed, they divided the French and British forces into two parts. The British army was left isolated in Belgium and the French were left to bear the brunt of the German forces. . The German army was substantially better than the French and the British. Hitler had built up the Germany army and in particular the air force (Luftwaffe). The Germans had developed superior weapons. 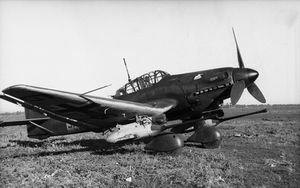 In particular, they had developed superior aircraft such as the Stuka dive bomber and the Messerschmitt ME fighter plane, that wreaked havoc on the allies . The Germans placed a great deal of emphasis on mobile and armored warfare. They had superior tanks, such as Panzer Mk iv, which easily overcame the allies in almost every tank engagement in the Battle of France. Even though the German army was superior to the French in many ways the Fall of France was not inevitable. 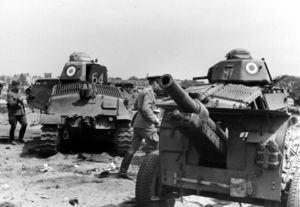 Captured French Somua S35 tanks being used by Germany in 1940 after the Fall of France. French military tactics were extremely outdated at the start of the war. They had failed to recognize that warfare had fundamentally changed since the First World War. They were over-reliant upon the Maginot Line, and they believed that this would stop any German invasion in its track. Since they did not believe that could defeat Germany outright, they hoped that the Maginot would drive up casualties and Germany to the negotiating table. They relied on defensive tactics and failed to grasp the impact of modern tanks and aircraft. The over-reliance on the Maginot Line meant that they were too defensive. The Maginot Line also failed to protect the entire French border. Instead of attacking France directly, Germany avoided the Maginot line by invading Belgium. French military planners have failed to plan for this contingency. The defensive line only partially defended France and indeed left the country open to an invasion via Belgium. The French High Command also failed to launch an offensive against Germany after the German attacked Poland. The French army simply hid behind the Maginot Line and waited for the Germans to attack. When the Germans finally did attack through the Ardennes, the French army was trapped in bunkers, and its fortifications were immediately outflanked. Even when the Germans invaded Belgium, the French General Staff continued with their cautious policy and were slow to respond to the German threat. While the French army was large and had been well resourced, it had not been modernized. It was still based on the idea that the next war would resemble the Great War. As a result, the French did not believe that any war with Germany, would be a mobile one, but rather a war of attrition. This meant that they failed to develop tank tactics that took advantage of their tanks offensive capabilities. Even when the French did effective field equipment, such as the SOMUA S35 tanks, they were mismanaged by French cavalry commanders. The Somua S35 tanks did not realize their true potential until German commanders commandeered them and utilized on the Eastern Front. During the invasion, German Panzer tanks quickly overcame the French defenses on the plains of Northern France. The French air forces were also no match for the Germans in aerial combat. The French army was unable to cope with the German Blitzkrieg tactics and was quickly defeated after only six weeks of fighting. In 1940 the French general staff was led by General Maurice Gamelan, an officer widely respected. A veteran and war hero of the First World War, he was credited with developing the strategy that led to the decisive French victory at the Marne in 1914. He had also tried unsuccessfully, to modernize the army. But Gamelin was suffering from a serious illness, whose symptoms included poor concentration levels, memory loss and other cognitive difficulties Gamelin’s memoirs, published after the war showed symptoms of paranoia and delusions of grandeur. The military leadership below Gamelin was generally poor. They were slow to respond to the Germans, and there was a marked reluctance to take any initiative and go on the attack. The political leadership of France was also very poor. 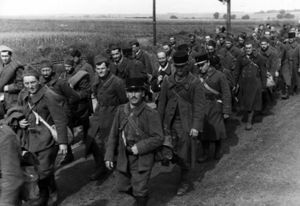 According to one French commentator during the war, they could not inspire the French people, they were more interested in fighting among themselves that the Germans. France was bitterly divided between the left and the right. This lack of unity in France was crippling at a crucial juncture in the war. The division also extended to the relationships between the military and political leadership of France. The French Generals were rights wing and distrusted the left wing politicians who ran France. French ministers also did not trust the judgment of their generals. The French officer corps was more worried about a Communist revolution than a German invasion. France was a powerful country with a large army and a vast Empire that stretched around the globe, but it was not cohesive. It had stark political conflicts, and many politicians were more loyal to their political party than their country. People on both the extreme Left such as the Communists or the extreme right hated the French government so virulently, their support of the French government could be best described as half-hearted after the German invasion. While France was protected by the Maginot Line and a fairly large army, it put up little resistance to Germany. It only took a few weeks for the entire country to fall. The reasons for the sudden defeat of France in 1940 were numerous and varied. They included a failure of leadership, both at the military and the political level. The army of France was not only poorly led but had been equipped with inferior arms and equipment. Moreover, the Maginot Line not only failed to protect France, but it encouraged a defensive mentality that allowed the Germans to take the initiative at crucial points during the invasion. The French public was also bitterly divided. These political divisions and incompetent leadership convinced many French citizens that their country could not defeat Germany. All these combined factors combined ensured a swift between May and June 1940. 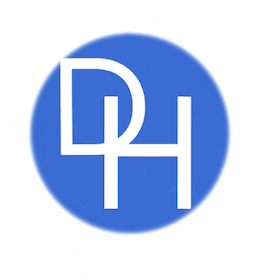 This page was last edited on 28 January 2019, at 23:08.